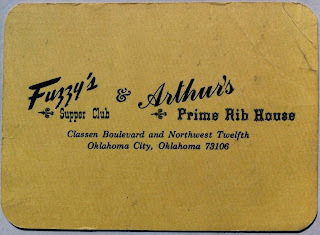 Fuzzy's Supper Club, "How to Get to Heaven," & the Case of the Missing "N"
In 1949, Arthur C. "Fuzzy" Rahill—son of Ray and Lillian Rahill who immigrated to the U.S. from Lebanon in 1907—went to work for a restaurant located at 1232 Classen Boulevard in Oklahoma City. He bought the business a year later and opened Fuzzy's Supper Club, which he owned and operated until 1983 when he retired and sold the joint to a Mr. Lobb who apparently spent $100,000 remodeling it to feature a "sports motif ... decorated with antique sporting equipment." Then, in a series of events that news reports don't fully explain, Rahill "took the business back through litigation" in 1984. 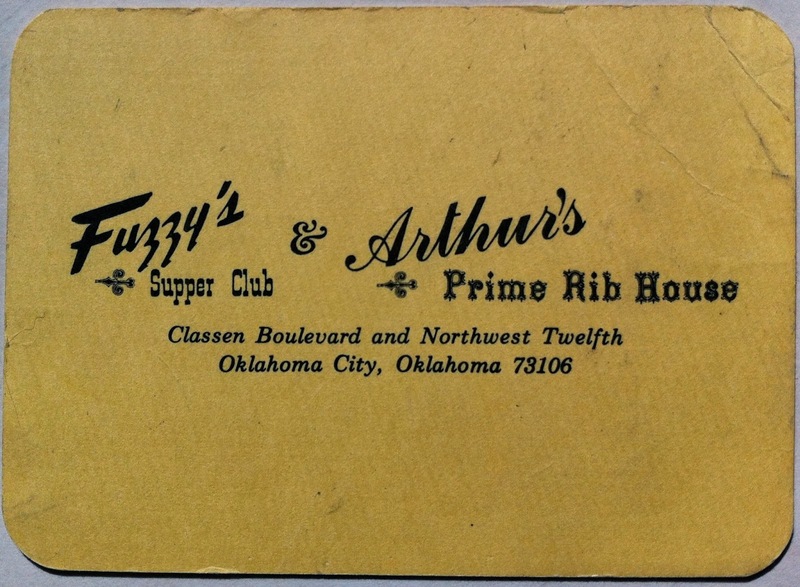 P&PC can't discover when exactly Fuzzy's finally shut its doors—the place was still open in 1987 when people were instructed to go there to buy tickets to the Oklahoma City Golden Gloves amateur boxing tournament—but Rahill died in 2003 at the age of eighty. For entrance to the fold! You've had your share of Hell! It's impossible to figure what exactly motivated Fuzzy to feature "How to Get to Heaven." Business cards have long included poems (see here and here and here and here, for example), and perhaps Rahill thought that the classed-up Arthur's merited a poem to class up its business card. 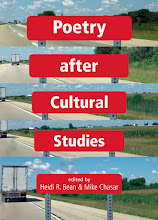 Or perhaps, we like to think, the ghosts of Rahill's birthplace in Springfield, Illinois, were speaking through him; by the time Fuzzy was born in 1922, "prairie poets" Edgar Lee Masters and Vachel Lindsay, both from the area, had put Sangamon County on the national poetic map. 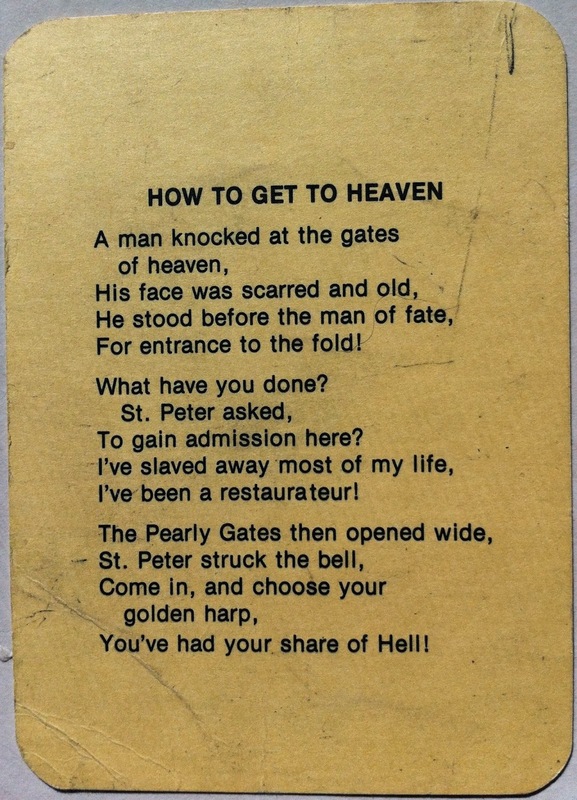 As it turns out, "How to Get to Heaven" is an intriguing little poem. It's part of a going-to-heaven or going-to-hell poetic tradition that not only includes famous old epics and modernist masterpieces, but popular texts as well—like the Depression-era poem "Rejected" (pictured here), which tells the story of President Franklin Roosevelt being denied entrance to Hell, or "The Grocer's Dream," which was printed on the back side of an advertising trade card for Majestic Sandwich Spread sometime in the 1930s and that you can check out here. 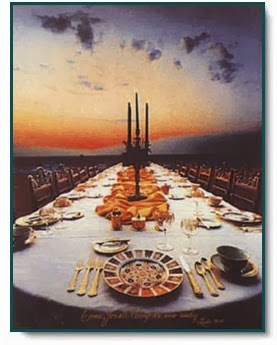 Unlike "Rejected" and "The Grocer's Dream," however, both of which leave their main characters in Hell (one unable to get in, and one unwilling to give up his seat), "How to Get to Heaven" features a protagonist who has already been to Hell and now appears, like Sterling Brown's hero in "Slim Greer in Hell," to converse with St. Peter at the Pearly Gates. 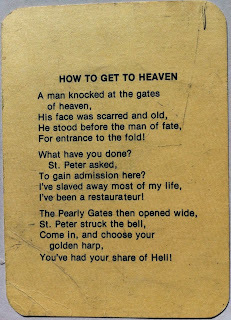 What intrigues us the most about "How to Get to Heaven" is not this narrative in particular, but what the poem appears to have left out. If you look very closely at the word "restaurateur" in the last line of stanza two, you'll see that the kerning (the space between letters) is a little off. There's more space between the "a" and the "t" of "restaurateur" than there is, for example, the "a" and the "t" of "Gates" in the fist line of the third stanza. 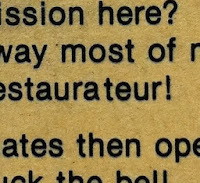 This is the only time in the poem that the kerning is irregular, and we think it's the somewhat Derridean trace of a change made during the printing process when "restauranteur" (spelled with an "n") was changed to the more proper term "restaurateur" (without the "n"). What effect, if any, does this missing "n" have on the poem? 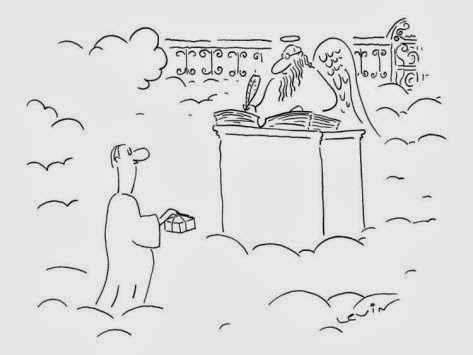 Well, for starters, we think it's the very thing that gets the poem's main character into heaven. 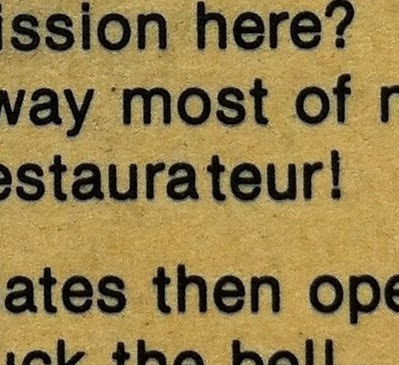 By using the correct but less frequently used term "restaurateur" instead of the more common but erroneous "restauranteur" to describe his occupation, the main character proves himself to be what he is in fact claiming to be; he is no pretender or impostor, but the genuine article who knows the difference between "restaurateur" and "restauranteur." 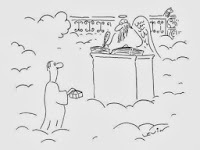 Unlike the typical scene at the Pearly Gates, which—like the scene of Roosevelt trying to get into Hell in "Rejected"—involves enumerating why one deserves entrance into Heaven and St. Peter logging or checking those reasons in his giant book, "How to Get to Heaven" has no justification other than the proper vocabulary word. St. Peter would no doubt appreciate the proper terminology, but he would also hear embedded in "restaurateur" the word's origins in the Late Latin restaurator or "restorer" (as opposed to "restauranteur," which is derived from the more mundane word "restaurant"), thus making "restaurateur" an account of one's occupation, a sign of one's legitimacy, and a sort of password, prayer, code, or miniature argument linking the earthly restaurateur to the Restorer for whom St. Peter (the patron saint of bakers, butchers, fishermen, and harvesters, btw) so diligently serves as chief "rateur," if you will. If that isn't awesome enough for you, then the extra space alerting us to the significance of the missing "n" alerts us to a feature of the poem's acoustic economy, as well, for eliminating the "n" also highlights the "ate" at the center of "restaurateur"—a morpheme that not only serves as a fitting metonym for the protagonist's career, but that echoes throughout the rest of the poem: in the "ate" of "gates" and "fate" as well as in the assonance of "face," "gain," and "slaved." Reading retroactively, in fact, it's hard not to see "How to Get to Heaven" announcing this acoustic theme from the very beginning, as the formatting of line one—which leaves "gates" hanging as a line break even though it's the middle of the poetic line—seems designed to call attention to this precise feature of the poem. What brings the protagonist's acoustic past to an end, however, is St. Peter himself, whose very name transforms "ate" (past tense) into "eat" (present tense), thus offering the main character the very invitation that a restaurateur spends his life extending to other people. In fact, can we not hear in the sound of the bell St. Peter strikes in line two of the final stanza the sound of a dinner bell calling the poem's hero (and Fuzzy, too, on March 16, 2003) to his just reward: a heavenly feast?